The New York Times is reporting that One Laptop Per Child has signed a Memorandum of Understanding (MOU) with the government of Libya, adding another potential implementing partner country to OLPC's list. Arising out of an August meeting between OLPC's Nicholas Negroponte and the Libyan leader Colonel Muammar Abu Minyar al-Qaddafi, the MOU apparently details an agreement of 1.2 million computers, one server per school, a team of technical advisers to help set up the system, satellite internet service and other infrastructure for $250 million dollars. Or a total cost of $208 dollars per laptop. Yes, that's a 100 percent price increase over the initial $100 dollar laptop guesstimate by Negroponte and our best measurement yet of the actual full cost of 2B1 Children's Machine implementation. Libyan school children will not start using the OLPC 2B1 until mid-2007 at the earliest, but when they do, what information and access will they have? The CIA World Fact Book says there are currently about 47 Internet hosts and 205,000 Internet users in Libya. They will soon be dwarfed by 1.2 million children - or will they? 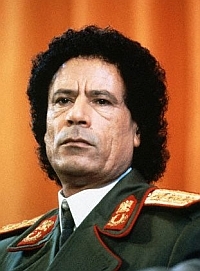 Would Colonel el-Qaddafi (Gadhafi) really let the next generation of Libyans have unfettered access to satellite Internet? To a fully editable and uncensored Wikipedia subsets? Somehow I think not. I even wonder what might a One Encyclopedia Per Libyan Child have as the image for the letter "G"? The idea appealed to the Libyan leader, according to Mr. Negroponte, because it fit into his political agenda of creating a more open Libya and becoming an African leader. The two men also discussed the possibility of Libya’s financing the purchase of laptops for a group of poorer African nations like Chad, Niger and Rwanda. I bet Col. Muammar el-Qaddafi would like to supply computers to the children of neighboring countries. It would be a more internationally palatable way to influence their politics and gain access to their resources than his outright invasion Chad's Aozou Strip or funding of terrorists abroad, including the bombing of UTA and La Belle discos, and Pan AM Flight 103. Reguarless, amid all the hype about this agreement, don't forget one small detail: this is a MOU not a Purchase Order and much can change between signing a MOU and the first OLPC 2B1 Children's Machine devilvery. However, Eng. Albert Butare, the minister of state in charge of Energy and Communication in the Ministry of Infrastructure, clarified to The New Times that Rwanda will neither be getting the computers free of charge nor receiving any subsidisation from Libya. Rather, the country will be buying the computers through Libya or any other country which has a direct agreement with the non-profit group. "their condition was that it could not start manufacturing unless they have an order of one million computers so we will buy through Libya or any other country which has a direct deal with him" said Eng. Butare. Yet another reason why I'm still bummed that the Libyan govt wouldn't give me a visa to visit the country following my visit to Tunisia for the WSIS summit last November. I was really eager to get a baseline sense of ICT literacy and the relative opennness (or lack thereof) of local Internet access. Looks like I'll have to keep it on my to-do list for some other occasion. hai,it will be a great project to think our chid development,but i can get the laptop and how i can get it,please reply my comment to my mail,Please. This calculation is flawed. The cost of a system is what a system costs. When you add in the support of servers, Internet and support personnel, it is not strange at all that the amount is higher. In the Netherlands we call it "calculating with a fork" .. Agreed, its not strange that the whole system cost is more than the cost of the hardware - that's the point of the calculation. In all its press, OLPC only refers to the cost of the hardware, which is now $150, not $100 each, but does not mention the full system costs. Therefore, there is the impression that the OLPC XO only costs $100 for _everything_ when you, and I know it really costs much more. In the USA, we call that false advertising. To be fair Wayan, when you look at buying a car you see the price the dealer is selling it for, not what you'll pay to get it 'on the road'. For every country that would like to take up the OLPC offer, the 'Total Price Of Implementation' will differ. In some countries their education system is well established but lacking the hardware to implement a digital learning system. The main cost of 'on the road' pricing for OLPC implementation will be the restructuring of the education model for those countries. The other costs can be readily absorbed by the existing infrastructure (transport, IT education, wireless network installation). In poorer countries the education model is less well developed and more open to change. Introducing a digital curriculum there will actually involve less costs. I'd be more inclined to believe that poorer countries will be open to humanitarian logistics support with 'Tech Aid' from interested IT specialists offering their free help in deployement. Maybe we'll see 'Sponsor A Village' on the horizon? Where is the confirmation by Libya? I looked on laptop.org, Google, and Yahoo search. There is no official statement by Libya that they are going to buy laptops. I could not find the agreement either. Which means we have to take OLPC at their word. This whole idea sounds real good in principle. I cant wait to see the implementation of this system in our country which I can bet would greatly benefit with the introduction of a digital learning system in its education system. it good idea from colonel Qadafi to agree to supply chilldren schools by these quantity of laptop, and will enhance thier effeciency, performance, and good education, regardless what is the cost. and some were asking for the company accept this price for good specification, why not it must be good spec. for enhancing new generation.